SeaTwirl has signed a Letter of Intent with specialist companies within offshore and solar power with the aim of together offer select niche markets with electricity from floating wind and solar power. For SeaTwirl, this is an exciting opportunity for a quicker path to revenues. SeaTwirl’s main target is to become a leading player in floating wind power and to deliver large cost-efficient wind turbines for the production of electricity to the electricity grid. A milestone on that journey is to develop a 1 MW wind turbine that will be launched in 2020. SeaTwirl has now identified markets where wind turbines of the size of 1 MW can meet a clear market demand and sees a possibility to build a business aimed at these niche markets in parallel with its main target. That can mean revenues for the company sooner than was originally planned. The niche markets that have been identified are islands and remote seaside villages, fish farms and desalination plants. These are business and places that today are run mainly on electricity from diesel generators, which is both expensive and emits CO2. In preparation for selling to some of these markets, SeaTwirl has entered into a cooperation with Unitech Offshore AS and NOVATON Erneuebare Energien AG. The companies will combine their expertise in offshore, floating wind power and solar panels to offer the market hybrid solutions with wind- and solar power. Together, the companies aim to analyze interesting markets and start the sales activities. – Novaton, SeaTwirl, and Unitech share the vision about building hybrid solutions for green sea-based electricity and to pool their resources and experiences to make that happen. Renewable hybrid solutions are the future for the green electrification and management of our sea resources. 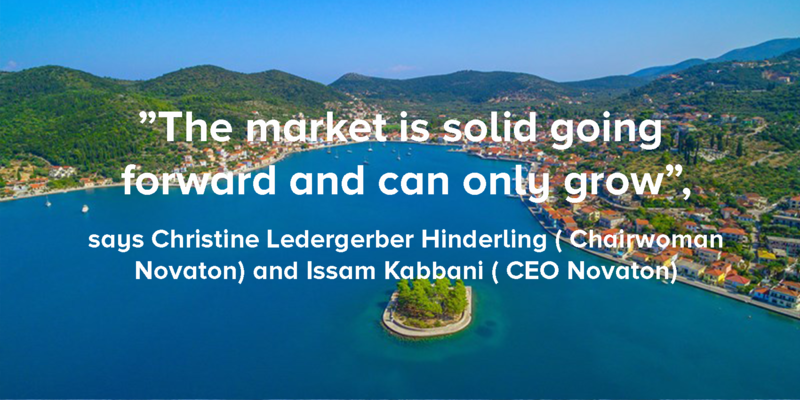 This is a solid market that can only grow in the future, says Novaton’s chairman Christine Ledergerber Hinderling and CEO Issam Kabbani. – Our main target is still to take a leading position on the, in the future, very large market for floating wind power, but on our way there, we want to get the most out of the development work that we are doing. That’s why we find this opportunity, where we take our 1 MW turbine and offer it as a part of a hybrid solution for niche markets, so exciting. It means that we can reach the market with our solutions more quickly, says SeaTwirl’s CEO Gabriel Strängberg.